Today in the neonatal unit at HEAL Africa Hospital in Goma, Democratic Republic of Congo nurse Elysee Samvura busily enters her data into an iPad mini and with a push of a button synchronizes the information to a cloud-based software. 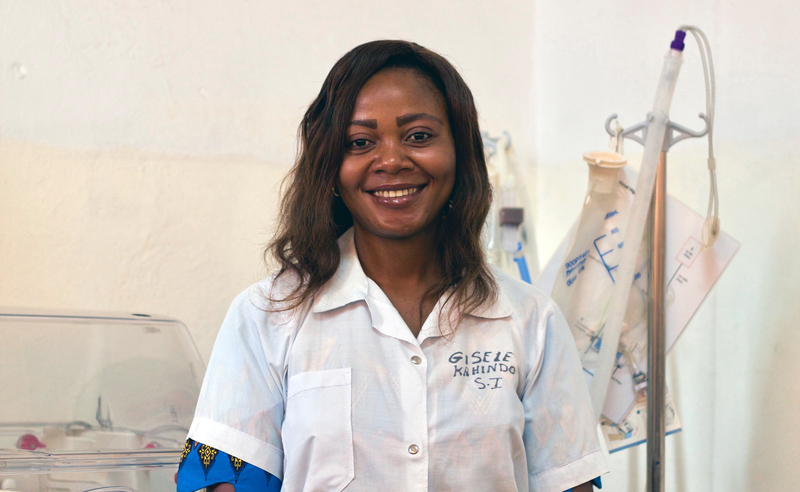 “That was easy,” she says and then quickly returns to her students who are nurses from surrounding hospitals here to learn the essentials of newborn care from their Congolese colleagues. There were two sets of twins born last night and Elysee and her trainees are busy caring for them. Another child has a congenital anomaly. A third child rests under a blue phototherapy unit. Elysee looks up and says that she likes the music that was purchased for her iPad—Johnny Cash. Of all the children who die before their 5th birthdays, 41% are babies. Global Strategies is working to change this statistic by investing in local nurses and providing them with the material and support to conduct an intensive training course. Unconvinced by “quick fixes” to address newborn mortality, we are taking the opposite approach with the Congolese-led nursing program. Nurses from surrounding hospitals receive a 3 month training course at HEAL Africa working shoulder to shoulder with nurses Elysee, Muka, Nadine and Judith. The project is under the watchful supervision of Dr. Eulalie Vindu who monitors the work in between seeing patients at the Children’s AIDS Program. Elysee tells us that she has been with her students when babies arrive and need urgent resuscitation and has observed and corrected their technique. After three months of immersion learning the nurses return to their sites confident and ready to apply their knowledge. Cindy McWhorter, Director of International Programs for Global Strategies pulls up her computer. In addition to collecting data in the nursery, she is also learning about the nursing students who have been trained. She provided Elysee with a digital survey and questions to get a better sense of the people behind the project. They are open-ended questions that are meant to inspire free responses. One of the questions asks, “Do you have a personal motto that motivates you?” We end this field-update with their responses. Global Strategies aligns with local and World Health Organization policies, especially in HIV work, to support the local government in setting up and implementing these policies.